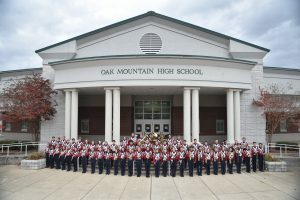 The Oak Mountain Wind Ensemble is made up of seventy-three ninth through twelfth grade students at Oak Mountain High School. Membership in the band is determined by individual audition. Since the school’s inception, the ensemble has continued to push the boundaries of high school musicianship by performing literature in the advanced realm of the wind band repertoire. Students in this ensemble regularly pursue roles in the Alabama All-State Bands and Orchestras. From 1999 to 2012, the ensemble was under the direction of Jim Duren. Now, under the direction of Kevin Ownby, the OMHS Wind Ensemble has continued a tradition of excellence, consistently receiving superior ratings at adjudicated competitions and assessments. The ensemble has twice been invited to perform at Carnegie Hall in New York City. In the spring of 2016, the ensemble performed as a featured band at the Music for All National Band Festival in Indianapolis. The ensemble has been invited to perform at the Alabama Music Educators’ Association Conference five times since the school’s opening, and will be performing at the University of Alabama Honor Band as a guest ensemble in 2018.